Located in Bowral, Gibraltar Hotel Bowral is a 3-minute drive from Centennial Vineyards and 5 minutes from Corbett Gardens. 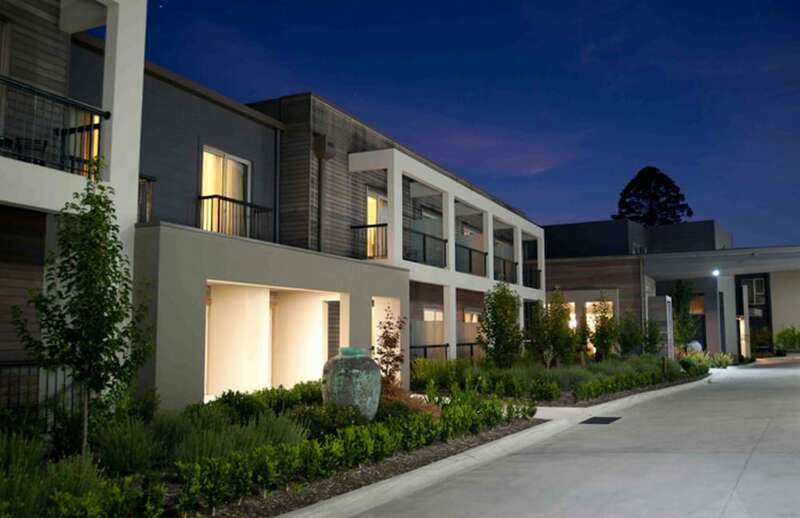 This 4.5-star hotel is 2 mi (3.3 km) from Bowral Golf Course and 2.2 mi (3.5 km) from International Cricket Hall of Fame. Make yourself at home in one of the 76 guestrooms featuring refrigerators and LCD televisions. Digital programming and iPod docking stations are provided for your entertainment, while complimentary wireless Internet access keeps you connected. Private bathrooms have complimentary toiletries and hair dryers. Conveniences include phones, as well as desks and minibars. Relax at the full-service spa, where you can enjoy massages and facials. While the golfer in the family is out on the course, you can enjoy above-par recreational amenities such as an indoor pool and a fitness center. Satisfy your appetite for lunch or dinner at the hotel's bar, Harvey's, or stay in and take advantage of the room service (during limited hours). Buffet breakfasts are available daily from 7 AM to 10 AM for a fee. Comfortable hotel designed around meetings and golf. Very convenient to central Bowral. The room was big and the bathroom large and clean. We ordered from the restaurant mid day and got our food in 30 minutes. The staff were very accommodating, even bringing an HDMI cable to connect my laptop to the TV. I'd certainly stay there again. Nice and quiet location. Staffs at the bar and restaurant were friendly and energetic. Great hotel... Kids loved. A little bit overpriced, but impeccable service and great breakfast. Be careful with the shower floor.. extremely slippery!!!! Lovely place for my friend's wedding. Beautiful space, amazing food and beautiful views of nature. Stunning. Of our Bowral experiences, this has been the best. Rooms are large but plain with basic furnidhings. Large bathroom with shower, no bath (which suits me). The bar area can be fun. Dining area is a bit spartan. Menu seems to have a Philippine theme. Snacks in the bar were a nice way we enjoyed dinner there. Located between Mittagong and Bowral, it is a reasonable walk into Bowral, so a car is advisable.